What a week! Our Bridge partners returned home with Marg & I Saturday night and after a good nights sleep, Sunday was spent catching up on washing and looking at a few of our local tourist attractions. I had hoped to grab some time to program but other than a quick look, it didn’t happen. Thankfully I had done some the week before I left. We all went to bed absolutely exhausted again Sunday night and would’ve preferred having one more day before heading back to school! On Monday, I decided to teach as per usual to give Pak Pahot & Ibu Eliza the opportunity to observe TCI methodology in the Indonesian classroom. 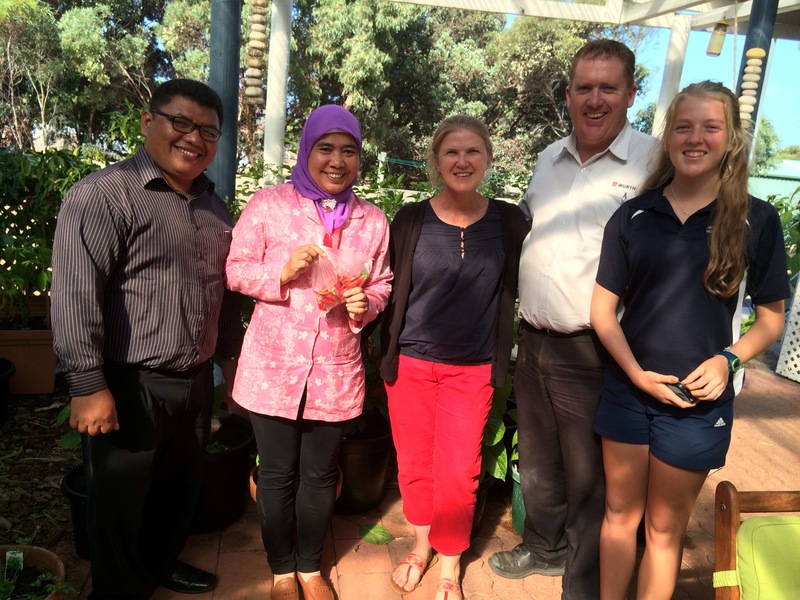 I didn’t say anything beforehand, other than to warn them that I don’t teach Indonesian the way other language teachers in Australia do, as I thought it would be easier to answer any questions afterwards. However, I was disappointed later when there were no questions or comments. 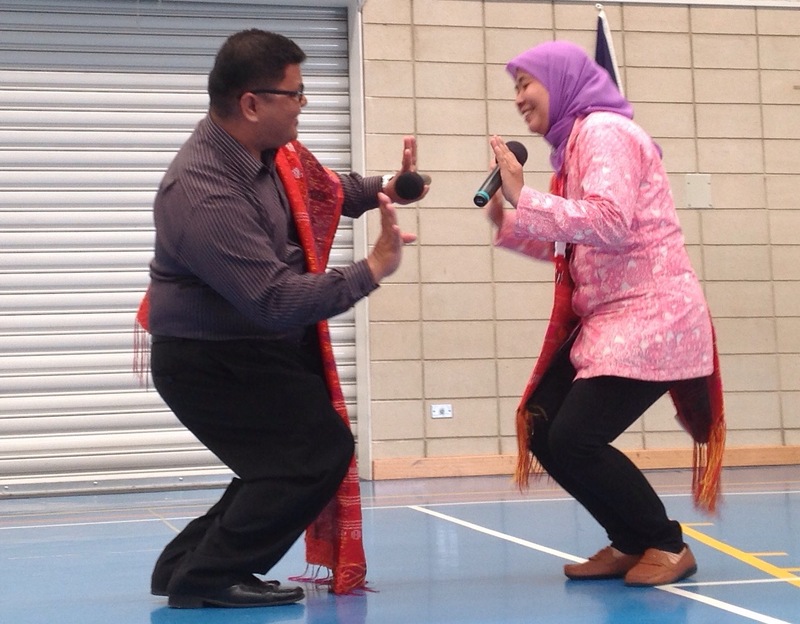 I later realised that both Pak Pahot and Ibu Eliza are classroom teachers, not language teachers! After school we discussed the schedule for Tuesday. Both said they had lessons that they’d like to teach. Ibu Eliza had brought a lesson about the 7 presidents and Pak Pahot wanted to teach younger students about 10 native Indonesian fruits. This worked out perfectly with the timetable for Tuesday as the 2 year 6/7 classes were first and the last two lessons were firstly a year 1 class and then a year 2/3 class, so we headed to the SSO room to prepare for our lessons using the PC’s which was easier than getting them onto the school wifi. Consequently Tuesday was a lovely day for us all. I supported both teachers for 4 of the 5 lessons I usually teach on Tuesdays with translations and classroom management while students thoroughly enjoyed being taught bilingually. Ibu Eliza’s lesson had several components to it and in retrospect would have been less rushed if we had spread it over 2 lessons, yet because we had so much to get through in 50 minutes, they didn’t have any time to get distracted. 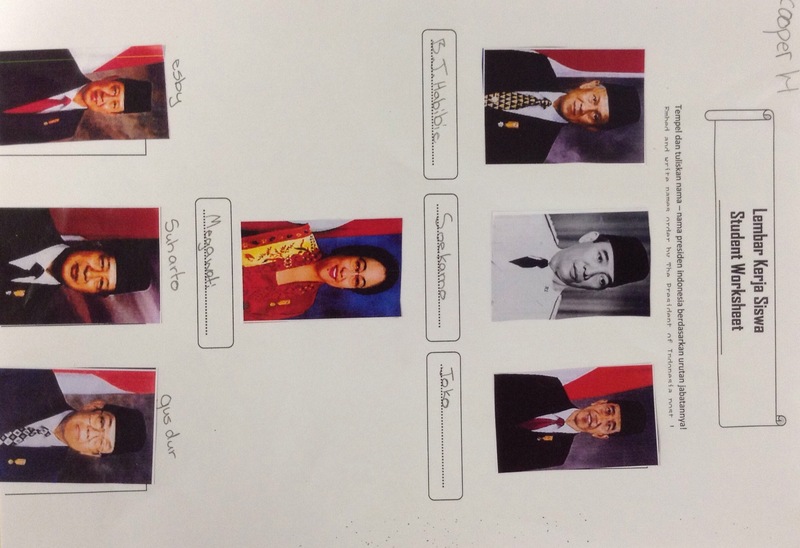 Students were divided into 7 groups and then given a page with a small picture of one of Indonesia’s past or present presidents at the top. Under the picture, students had to write down 5 questions they would like to know about that president. The questions written by students were varied and ranged from what is his/her name? to: Was he/she a popular president? Each group then had to choose one of their questions and then they were given a paragraph of information about the president they were focusing on. Students had to read through the information to find the answer to their question. Any other information they discovered was written underneath a picture on another sheet handed out to groups. Had we enough time, Ibu Eliza had hoped that each group could share what they had learned about each president, however we were getting close to the end of the lesson, so we jumped straight into the next step which was to hand out another sheet with 7 boxes and 7 pictures of each of the 7 presidents and have students glue them on in order of presidency writing their names down underneath. By the 2nd lesson, Pak Pahot had simplified this for students by numbering each picture on the back! Students then had to ask each other for names of each president. The students responded well to this lesson and as the students needed to work quickly there was little time for off task behaviours. I did enjoy a quick discussion with one group who had Joko Widodo. They asked me to confirm if he was the current president who supported the death penalty. When I confirmed that it was, they then all had a really great discussion on their own opinions. I was so impressed with their comments and that they didn’t all agree yet respected each others opinions. 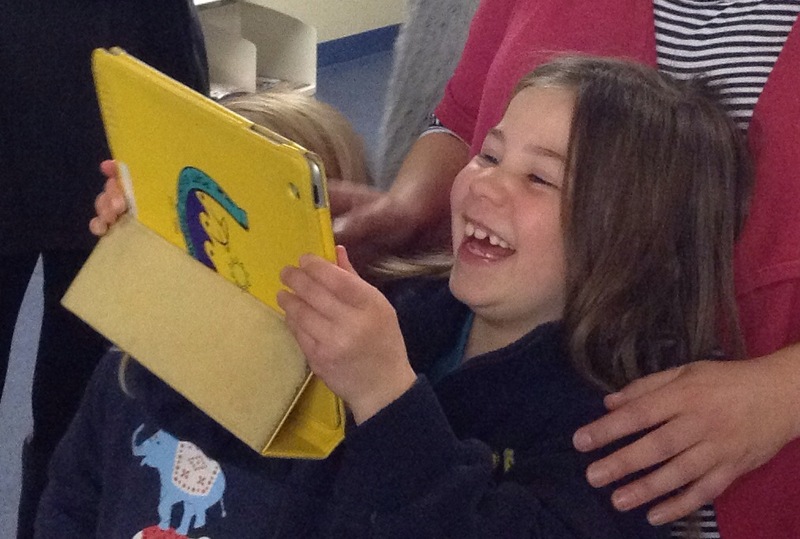 After recess, in my non contact time, Sandy, the year 3 teacher, Skyped us for a mystery Skype. 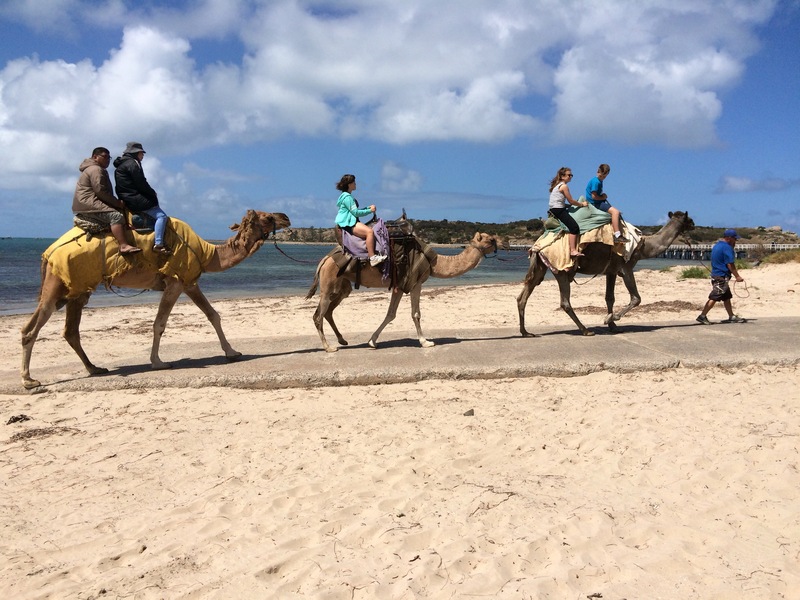 The original plan had been to do the mystery Skype from Sydney but for many reasons, this didn’t happen. 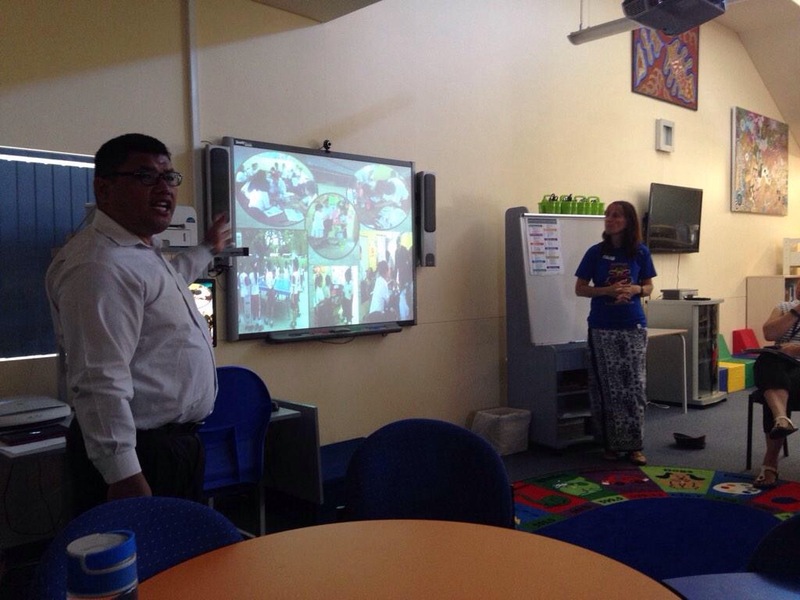 Because the aim of a mystery Skype is to guess the location of the other ‘school’, we couldn’t tell anyone at all where Pak Pahot and Ibu Eliza come from beforehand!! 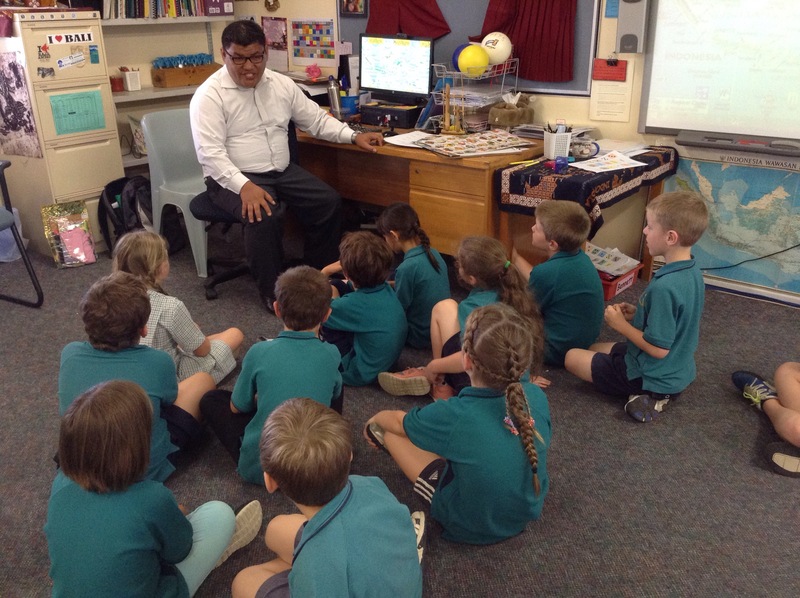 We sat in the Indonesian room while the Year 3’s remained in their room, each with maps of Indonesia in their laps. There first question was, “Do you live in the Northern Hemisphere?” which was a great one as it eliminated so much of Indonesia and didn’t take them long to hone in on Medan! 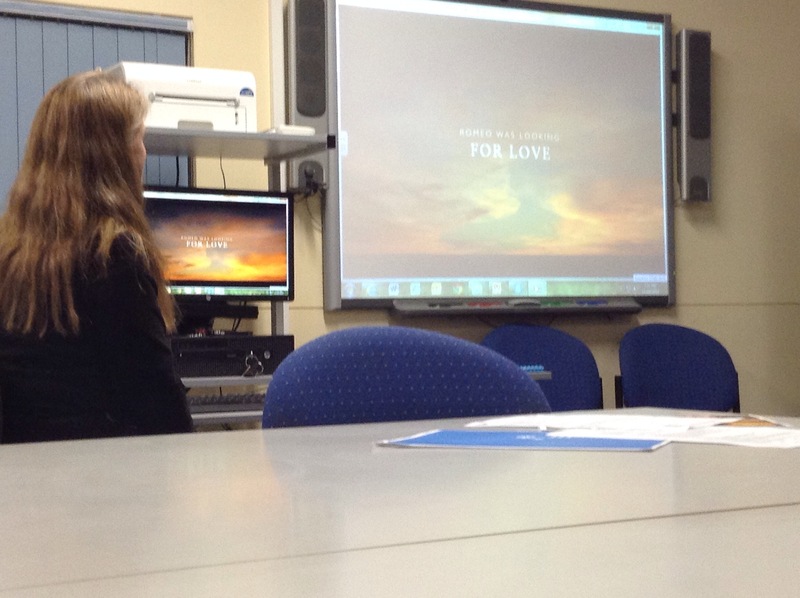 It was lots of fun even though the poor students were confused when I asked them to look at us and in doing so turned their back on us as the webcam was on the PC yet we were projected up onto the smart board!! Sorry guys!! Do you have any pets? Pak Pahot has a dog called Whitefang and Ibu Eliza has fish and chooks. Do you have any children? Pak Pahot has a 9 month old son named MIchael. Who do you live with? Pak Pahot lives with his wife, his son and 3 younger brothers whereas Ibu Eliza lives with her husband and niece. 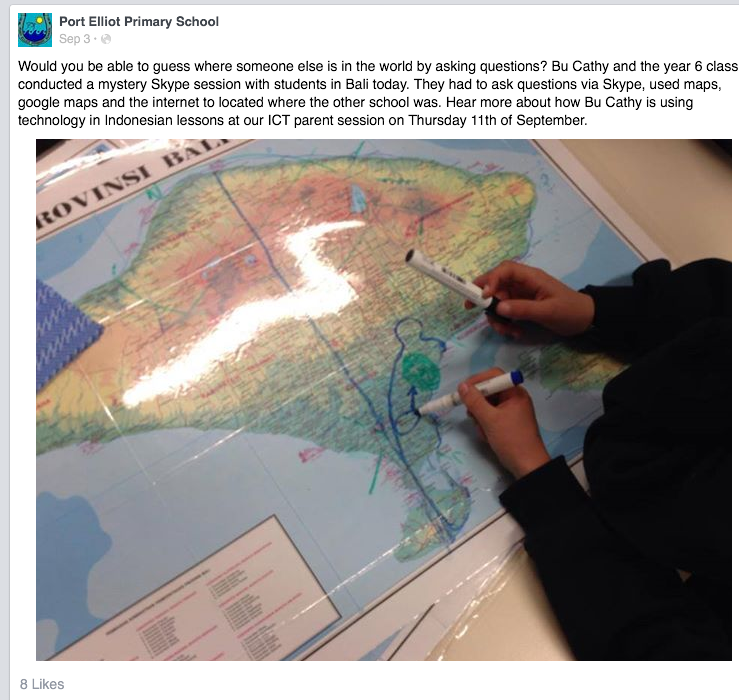 Sandy has blogged about the Mystery Skype in more detail on her class blog. 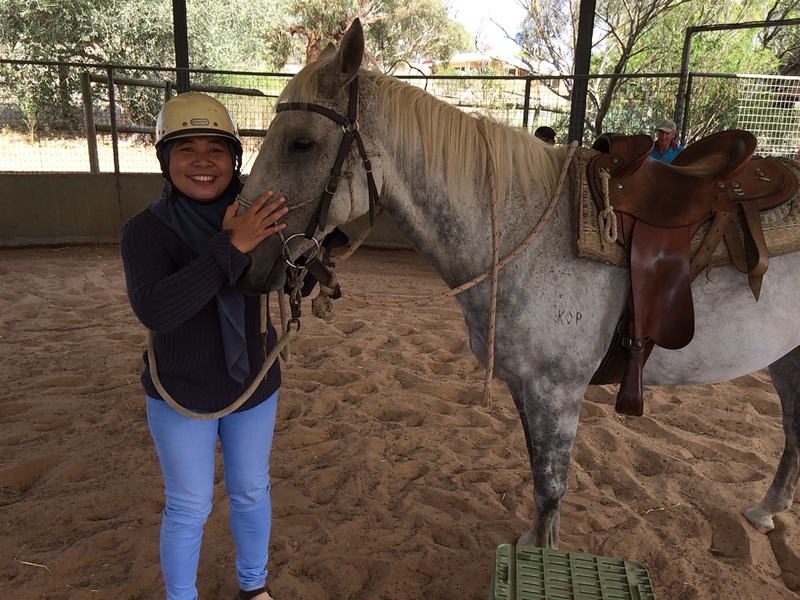 Read the post here and read what the students wrote about the experience! My one and only lesson I taught that day was introducing reception students to the numbers 1-5 and then it was lunch time. After lunch, Pak Pahot showed a powerpoint he had put together of the 10 fruits he wanted to focus on. He explained that there are over 400 different varieties of fruit in Indonesia and no matter where you are in Indonesia, you will come across a huge selection to enjoy We then looked at the powerpoint and learned what they are called in Indonesian and for many students, we also learned what they are called in English!! Fruits included banana, starfruit, soursop, durian, rambutan and mangosteen. Students then worked in groups to match 5 of the fruits to their Indonesian names using pencils. Each group was then asked to stand up. One student held the sheet while the second student pointed to each of the fruits and the third student said their name in Indonesian. 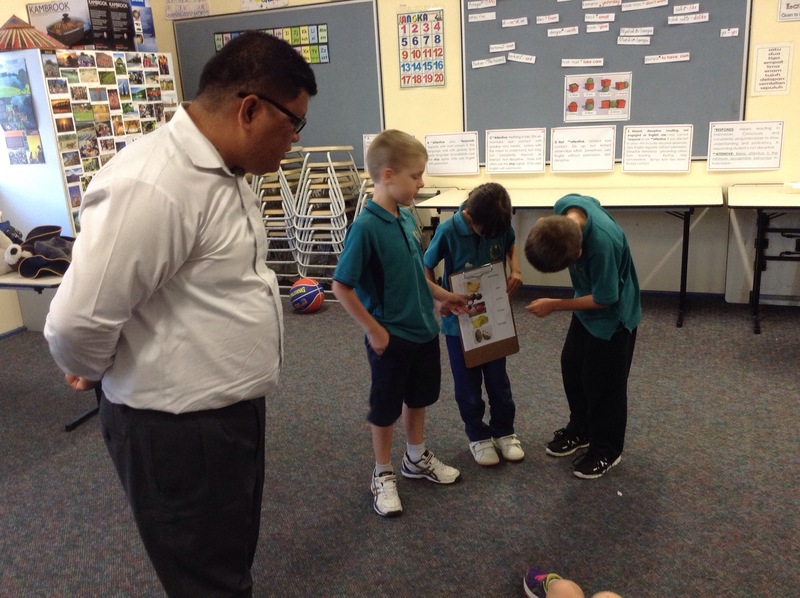 Students were fascinated with the variety of fruit available and surprisingly quite a few have tasted them either here in Australia or on holidays in Indonesia. We then had just enough time to fill up our drink bottles before presenting at the staff meeting. I introduced both our visitors, explained about the Bridge Project and then Pak Pahot presented a powerpoint presentation about his school, his students and the various programs running at their school. Afterwards there was a brief question and answer opportunity where teachers asked specifics about special education programs, how remedial students are catered for (after school), the school day, etc. I then briefly introduced staff to the AEF website which is an amazing resource for Asia & Australia’s Engagement with Asia. It’s about to be updated too!! I also circulated a timetable for teachers to nominate blocks where Pak Pahot and Ibu Eliza could come in and observe lessons. The rest of the week was spent by visiting various classrooms which ranged from receptions to year 7’s and covered most subject areas, including PE!! 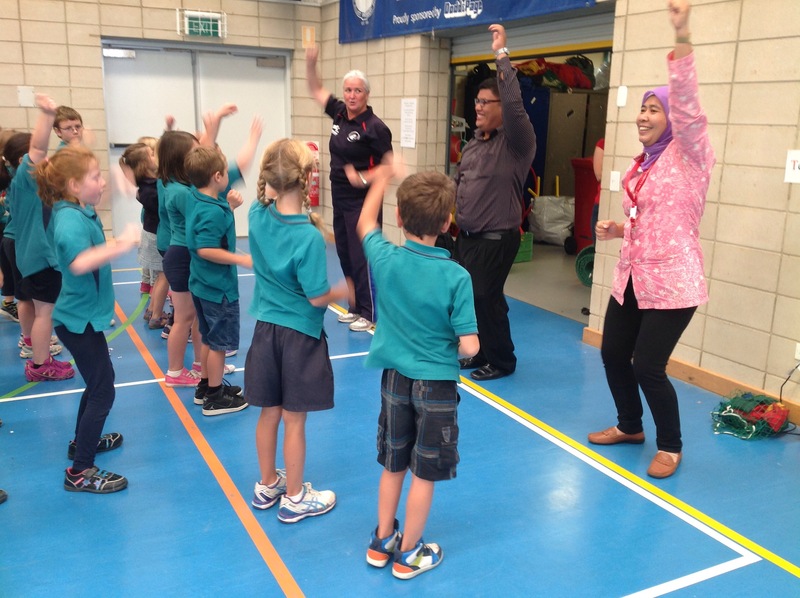 The Sports Day warmup in particular was a huge hit! 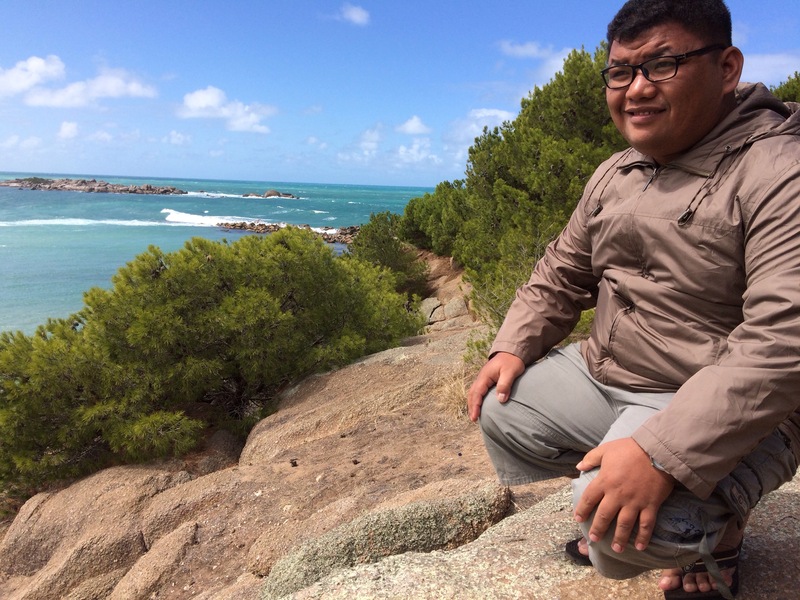 The only subject Pak Pahot has yet to observe and is really keen to see is science, so a note in the daybook will hopefully tick that box for him. 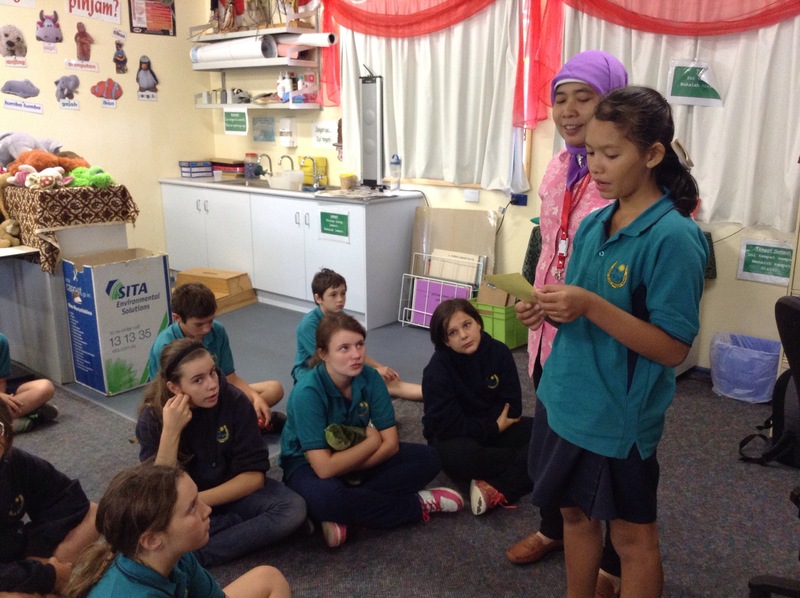 Yesterday they spent quite a bit of time with the Year 5/6’s in Mrs Roberts class to work on ‘biodata’ letters for students in Ibu Elizawati’s class. 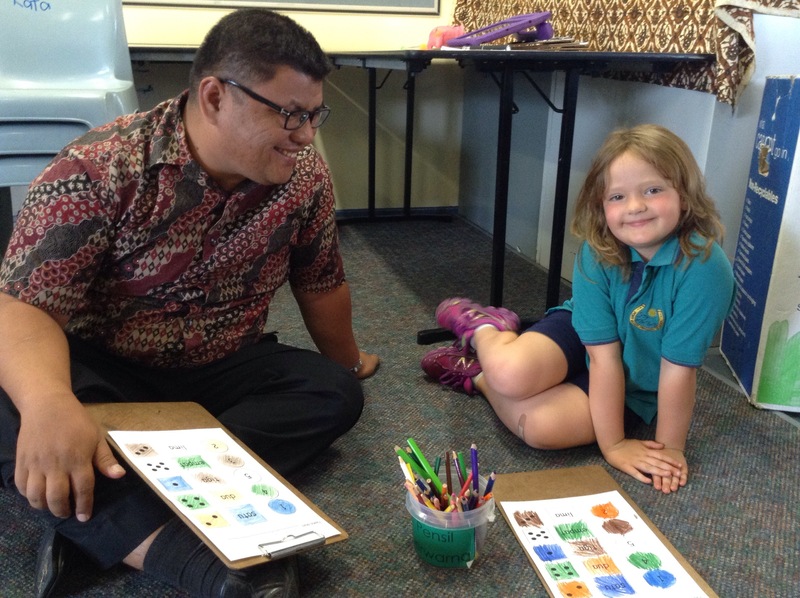 We looked at one of the ones that Ibu Eliza had brought with her which was all in Indonesian and then looked at the various dot points our students would include in their own biodata. Interestingly, two culturally different aspects arose!! Our students want to add their beloved family pets as they are considered parts of our family and secondly most of the students in the year 5/6 class either don’t have a religion or did not know what religion they are!! What a contrast to Indonesian students!! When I asked Pak Pahot what students could write if they don’t have a religion he was at first confused!! Such a foreign concept for Indonesians!! Thursday finished with a whole school assembly which was attended by a large number of parents as it was being run by the year 2/3 class. 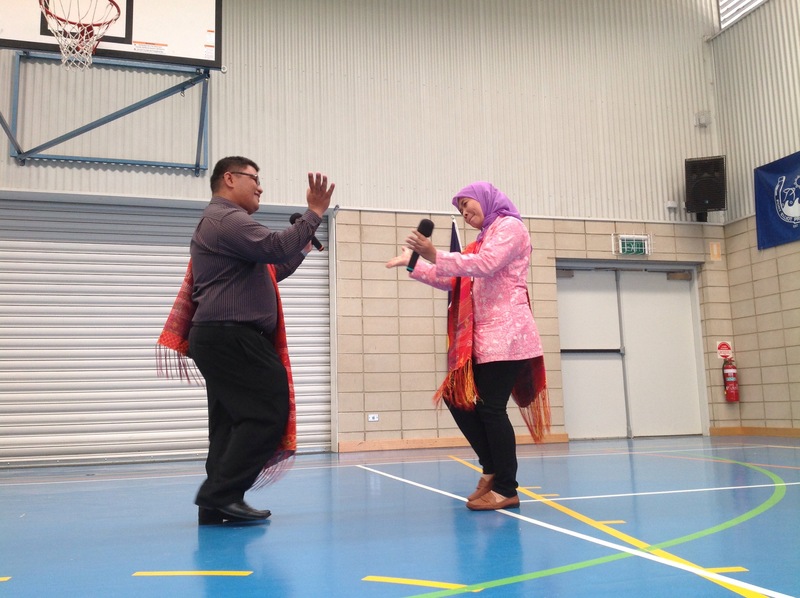 After welcome to country and the national anthem, Pak Pahot & Bu Eliza had everyone riveted with a Batak song and dance. The applause at the end was incredible and a true indication of how much we all thoroughly enjoyed the performance. After school we were invited to drop in to Sandy’s house to get a tour of their chili garden. 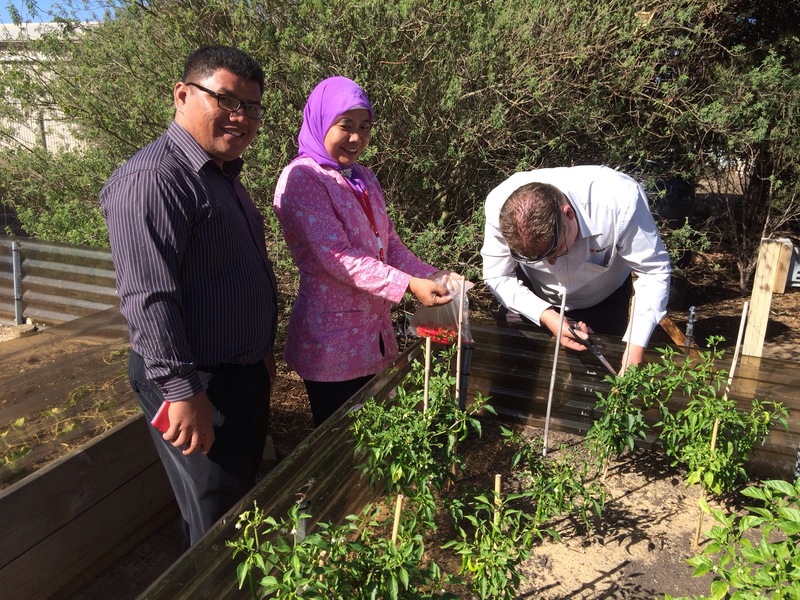 The look on Pak Pahot’s and Ibu Eliza’s face when they realised just how many chili bushes there were was priceless. I too was impressed and particularly enjoyed the delicious sambal Ibu Eliza made to go with our fish that night! As I don’t work Fridays, today we are enjoying a lazy morning and then we will head in just before recess to join Marg and her year 5/6’s for a Skype call to Port Macquarie where the other 2 teachers from Medan are being hosted. The last lesson on the timetable is choir which I doubt wild horses couldn’t keep Pak Pahot from attending!! 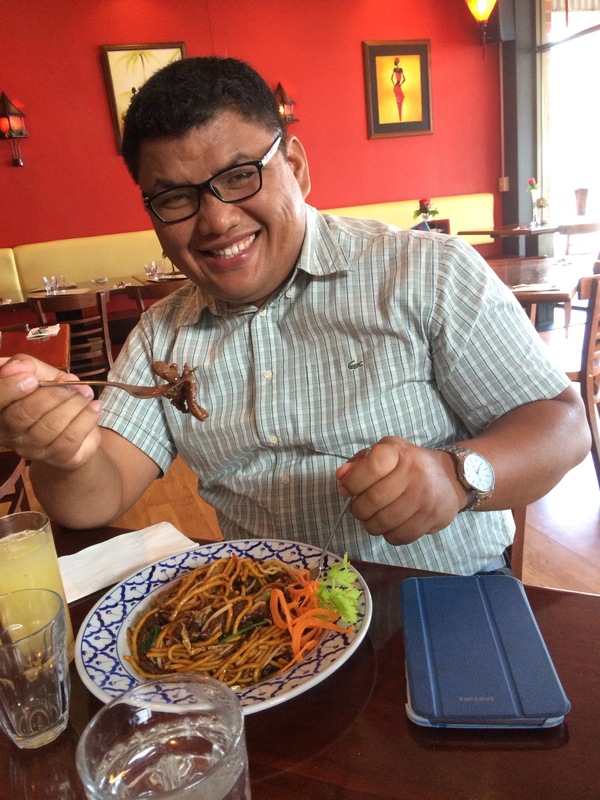 To round off the week, we went out to dinner and Pak Pahot enjoyed tasting kangaroo! 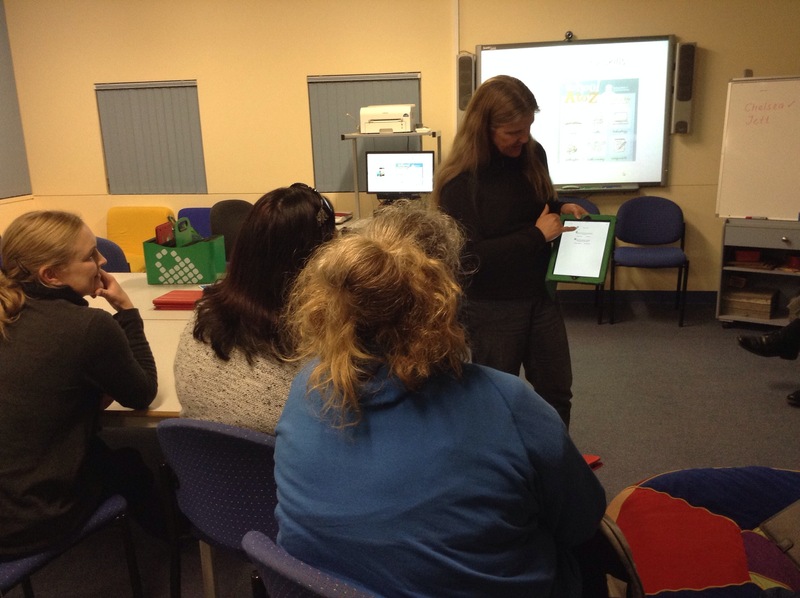 On Thursday evening a group of 3 teachers & our principal invited our parents to come and learn about how teachers are using ICT in the classroom. 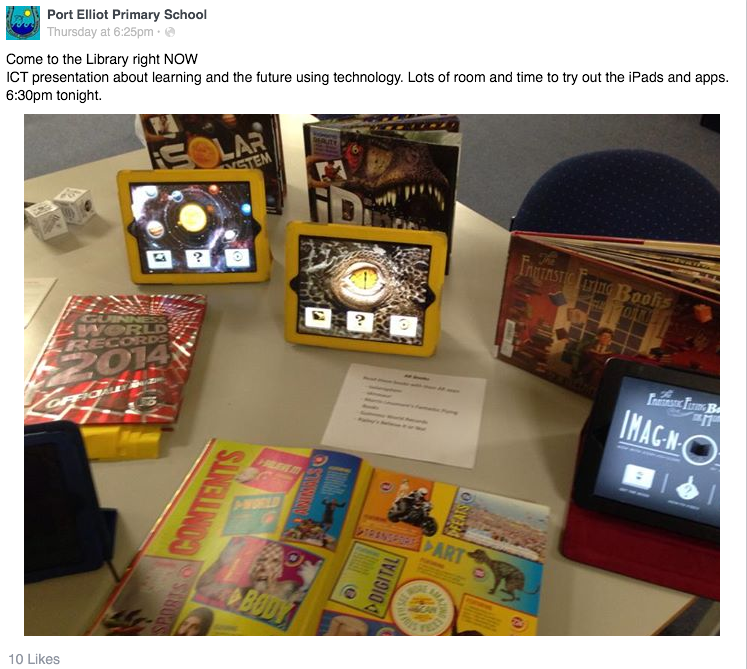 We promoted the event through our newsletter, word of mouth & on our school Facebook page. The 3 teachers were Sandy, a year 3 teacher, Kathy, a year 7 teacher & ICT coordinator and myself, so we were a pretty good cross section of teachers from PEPS. We were all there early to prepare for our presentations and Kathy also set out a great display of recent purchases that have been very popular with students. Our first families to arrive went straight to this table where the children had heaps of fun coordinating the ‘dinosaur’ to munch on Mr Hudson (our principal)! While the number of parents who turned up wasn’t overwhelming, it was a lovely, cozy group, representing all year levels, which created a warm and friendly atmosphere. Brenton welcomed everyone and then gave a brief presentation which included his wish to create an innovative school which focuses on teaching 21st century skills to students whose future will require skills and knowledge we can barely even imagine. 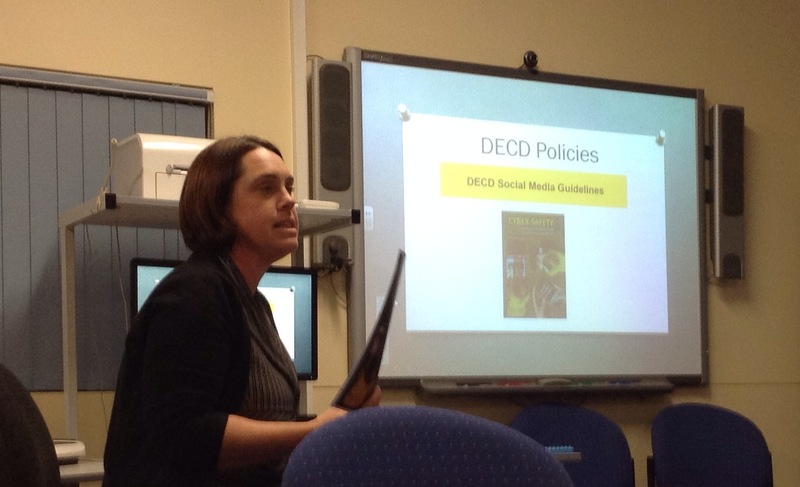 Kathy next outlined the DECD policy and how we implement and enforce it in our school to ensure students develop cyber safety skills. 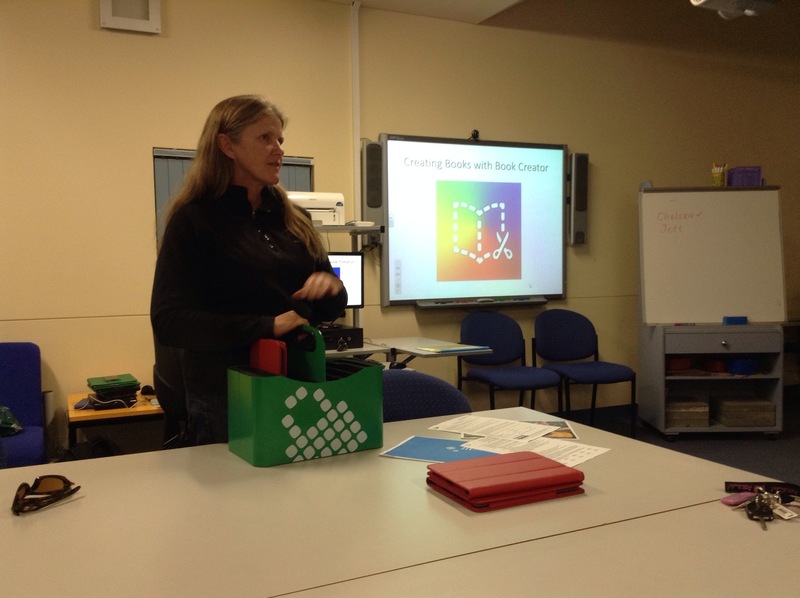 Sandy next took the stage and shared with the parents the various ways in which she has used technology in her classroom. 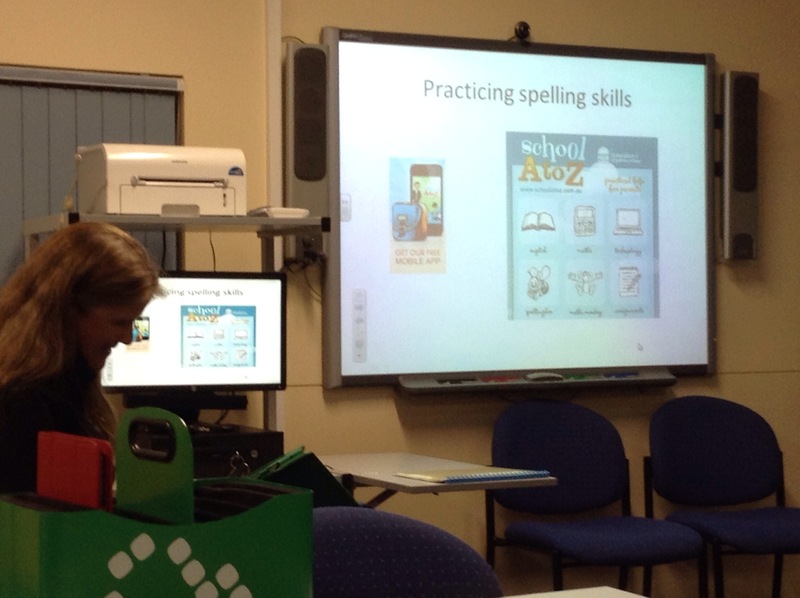 Parents enjoyed a demonstration of how students use it to learn their spelling words. Sandy also shared a recording of a student demonstrating his ‘paddleboat’ creation made from plastic bottles before sharing with parents her class blog. 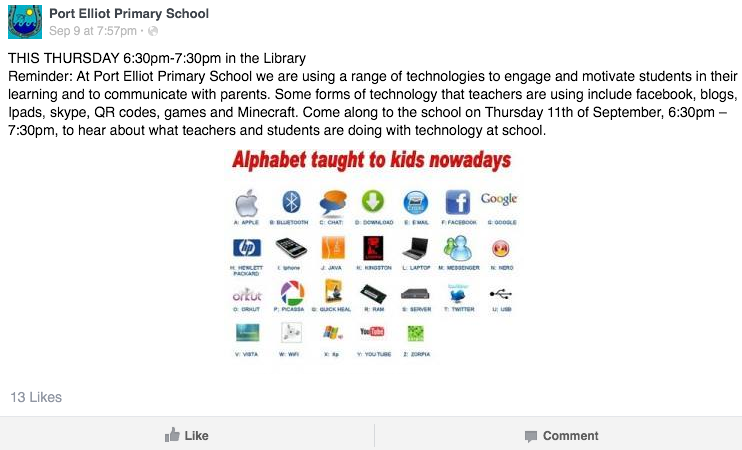 As Sandy finished up saying, these are just a few of the ways in which ICT is incorporated into her classroom! It was my turn next. I had planned for a friend in Indonesia to be available to do a mystery Skype with the parents so they could experience the fun firsthand. However as the parents walked in the door, I received a message from her apologising that she could no longer participate. 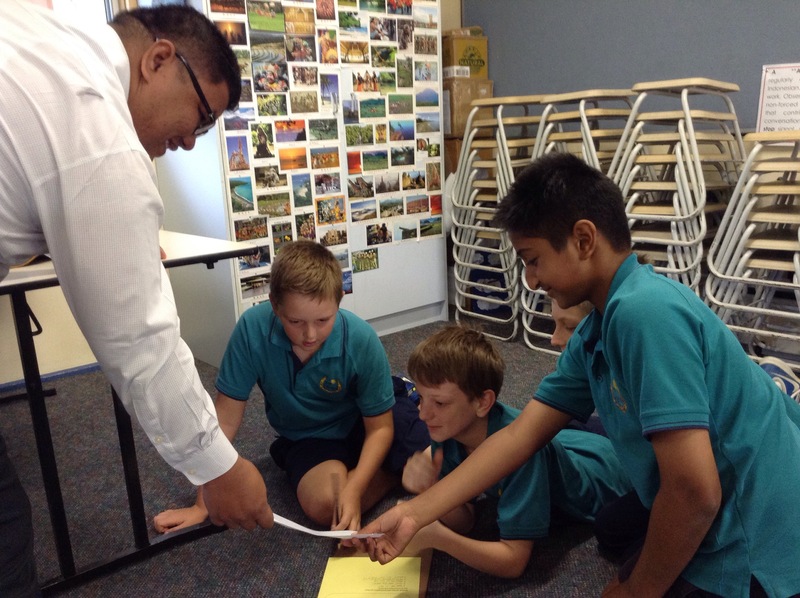 So instead, I shared a video I have put together using footage from the Mystery Skype the Year 6’s did last week with BIS in Bali. In retrospect, this worked even better, because it was provided a brief snap shot yet captured the real excitement and collaboration involved. 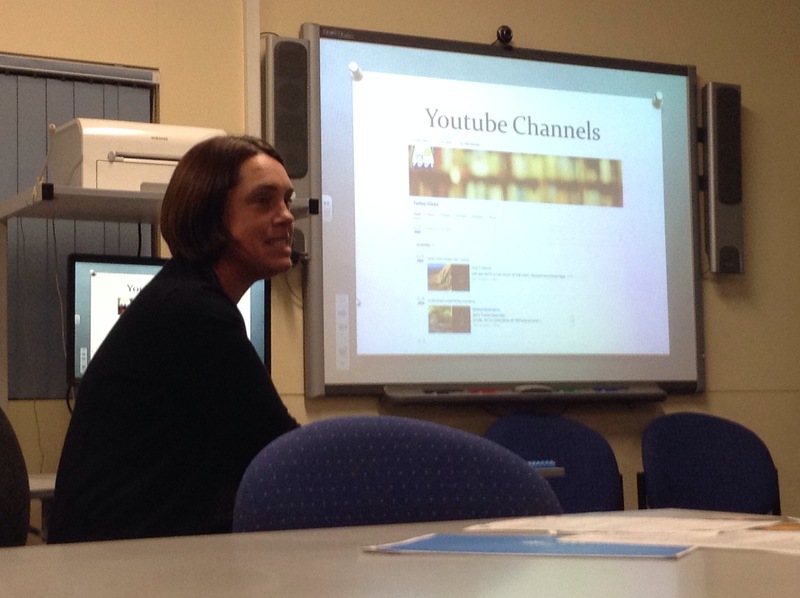 Kathy concluded the evening with a video she had put togther highlighting the various projects currently being undertaken in various rooms including minecraft, stop animation and puppet pals. It was a great way to finish on a high note. It was brilliant being involved and I was truly chuffed to be invited to speak to the parents about what has been happening in the Indonesian room lately. The following morning, one of the parents caught me to express her thanks and appreciation to us all for holding the event and she told me that she was gobsmacked at what teachers at PEPS have been doing with ICT in our rooms with our students. What great feedback!